we’re as good as dead. I’ve read an article somewhere titled: “10 Reasons why you should watch Braven“. I agreed with a few points. You could say the movie is a retrospective of action films from the 90s. But there are reasons enough to simply skip this mediocre action film (for you to discover these reasons while reading). It’s not because Jason Momoa became known to the wider public as “Aquaman” that you can call this film successful. Personally, I thought he was superb in “The Bad Batch“. And even in the ridiculously bad movie “Wolves” he was the one who impressed me the most. Most probably because of his impressive muscles and those special colored eyes. But even those hypnotic eyes can’t really improve a movie like “Braven”. A cabin in the woods. Always trouble there. 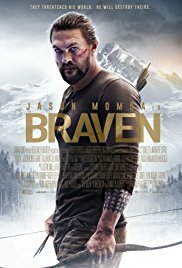 In “Braven” Momoa plays the robust owner of a logging company, Joe Braven. And with that, the title of this film is explained already. Joe is a good-hearted man who’s concerned about the welfare of his employees. He’s a true family man who truly loves his wife Stephanie (Jill Wagner) and adores his daughter Charlotte (Sasha Rossof). And then there’s his father Linden (Stephen “The monkey’s paw” Lang) who shows signs of Alzheimer’s so he doesn’t find the Christmas lights and thinks strange women are his dead wife. And that’s the source of misery. The moment Joe decides to go to their isolated mountain cabin with his father to discuss possible options, he doesn’t realize that some obscure drug gang is using this hut as a storage for a significant amount of drugs. One thing certainly isn’t missing in “Braven”. And that’s the aspect of predictability. The fact that Joe and his father are present the moment this drug gang tries to recover their goods, isn’t exactly a surprise. Also, Joe’s daughter Charlotte belonging to that group of stubborn teenage daughters is something you could expect. And that stubbornness also kicks in at the least favorable moment, so Charlotte is also present during the confrontation. Not problematic enough yet? Trust me, Joe’s wife Stephanie also has a membership card from the club “wifes-who-always-show-up-at-the-wrong-time”. Fortunately, Stephanie excels in the Olympic discipline of archery. There are also a lot of what-the-hell moments. Father Braven suffers from delusions and forgets a lot, but appears to function well when he’s under pressure. Fortunately, he wasn’t delirious during the confrontation and started to think that one of the gang members was his son. That would be rather problematic. I also found the fact that a hair band gave Kassen immediate insight, rather impressive. And then there was that nonchalant thrown down knife. Hold on tight. Although this was an immense forest, the one who it was intended for actually found it. Rather ridiculous. Especially when you see the same guy bumping into a tree just before that. After which he looks at it in a surprising way, thinking “What’s this tree doing here in this forest …”. Hilarious. “Braven” isn’t really bad. But you won’t be blown away by this clichéd action movie either. Even the use of an ax on fire, won’t get you ecstatic. Ultimately, you can only conclude that thousands of such films have already been made. To finish on a positive note. Garret Dillahunt can join the group of most intriguing bad guys in film history. A cruel person who smashes someone’s head and looks at everyone with an apathetic gaze. Indeed a psychopathic figure. But just like the rest of the film, not really innovative and far from intelligent.